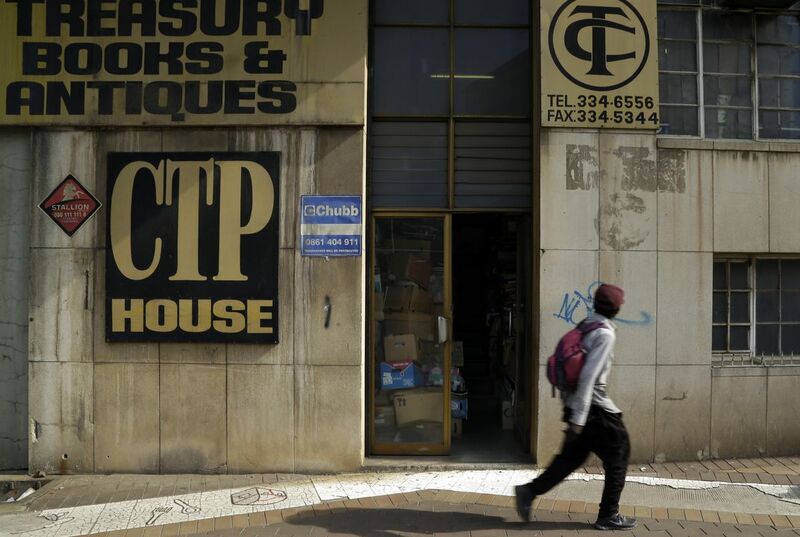 The only clue to a literary treasure trove tucked away in downtown Johannesburg in South Africa is a fading sign. But behind this door is a fantastic maze. It contains an estimated 2 million books and prints. 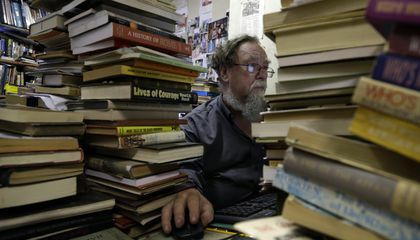 The Collectors Treasury, a three-story bookshop owned by brothers Jonathan and Geoff Klass, is dedicated to preserving history. It contains everything from VHS tapes of classic TV to porcelain trinkets. Above all, books are prized. "It is the symbol of the history of the human race," says Geoff Klass. The collection is vast and eclectic. It includes yellowing news clippings, posters and first editions of John Updike, Alice Walker and H.G. Wells along with Enid Blyton's beloved children's series "Noddy." It's also getting more traffic as downtown Johannesburg is revived. The bookstore is now on the hipster trail of the trendy Maboneng district. The area includes art galleries and rooftop markets. Biographies of Leon Trotsky and Humphrey Bogart sit alongside the story of Wham. That's the '80s British pop group that launched George Michael's career. Another room holds fraying antique books. Some date from the 16th century. There are heaps of non-fiction books. They range from angling journals to contemporary Russian art. "It's a landscape of books rather than shelves of books," said Los Angeles set designer David Chow. He learned about the shop online. He set aside a whole day of his trip to explore it. The Klass brothers have embraced the Internet as a portal to new customers. But they remain devotees of the printed page. Their collection also features a copy of the manuscript of George Orwell's "1984," scribbled, corrected and typed over as the author crafted the classic. "What would have happened if he had been writing it on a word processor?" asks Geoff Klass. Why do visitors thread single file between stacks of books? Visitors thread single file between stacks of books because the place is crowded with books. As the article says that it contains and estimated two million books and prints. I thought the article was interesting because I love to read books and go to bookshops. The visitors are in single file because of how old the books and they want to get a view of them without all the clutter. The books are fading, so everyone wants to see them before they are gone. this article is very great it teaches me a little history about books and a little mystery.and there was a book loved by kids named "noddy". "Visitors thread single file between overflowing shelves and stacks of books." To me, that's pretty amazing. I would definitely visit for touristic experience and to discover new things about history and culture that most people haven't even heard of. The South African bookshop in downtown might have been able to be a hit because the bookshop that is filled with books might have been able to attract people to be seeing the whole book collection. The people might have been amazed by the bookshop since there are a ton of books inside the bookshop, it would need some space to be filled in with its book that the bookshop owner had made. The people might have been able to get amazed by how many books that the bookshop owner has in order to amazed the people that wanted to come inside the bookshop to check out the books. People might have been able to get amazed when they first saw the amount of books that the bookshop owner has and how much that it had taken to fill in every last space. Critical Thinking Question: Why do visitors thread single file between stacks of books? Answer: Because since that the stacks of books had been able to make a maze, it would take one people to get through the stacks of books. Visitors thread single file between stacks of books in order to get a chance to read them. The bookstore mentioned in the article has become very well known, and people have started to come more often, meaning the average rate of people arriving each day has increased. When this increases, you find that the store has many costumers. With so many costumer they have to line up in an orderly fashion and look for books that appeal to them. Though it is unlikely that it is a continued line throughout the store, it is not far off to imagine that a line can be loosely traced through the stacks and shelves. visitors thread single file between stacks of books becuase the shelvs are overflowing with books DvDs tapes. Some people may be looking for diffrent dates so the books are put in dates or author. Jonathan and Geoff Klass do that so it makes it much eaiser to find books their are many more catogories such as non-fiction, fiction, age, art ext. Everyone who are in the file has to be set up as in how old the books are.It is pretty amazing that the visitors experience new things about the history and culture. I'm thinking that one day I want to go visit there and see how it all works out for me and learn more about my history. Visitors "thread single file between stacks of books" so they can get a clear sight of all the books. Since the book store "contains an estimated 2 million books and prints" people try to see the most books this way. Also since the shelves are "overflowing" with books they have to go single file because if not they could most likely knock over the outside books! My opinion on this article is that its crazy how many books one library can hold!